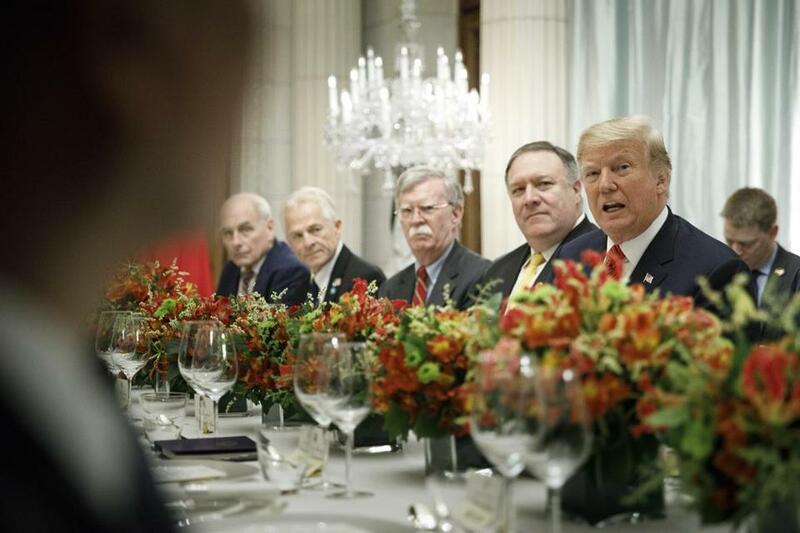 President Trump, seen at a bilateral dinner meeting with President Xi Jinping of China during the Group of 20 summit, issued tweets Wednesday that offered a positive take on the possible outcome of trade talks with China. WASHINGTON — President Trump tried to calm global markets and ease concerns on Wednesday that his trade truce with China was floundering, declaring in a series of Twitter posts that the Chinese government was sending “very strong signals” about a weekend agreement he reached with President Xi Jinping and suggesting that US exports to China are about to surge. Trump and his advisers have been touting the trade truce reached in Buenos Aires, Argentina, as a victory, saying that China had agreed to buy $1.2 trillion worth of US products and address its long-standing practice of requiring companies doing business there to hand over technology and trade secrets. Trump has said repeatedly that China will “immediately” begin buying more US agricultural products and that it is prepared to drop its 40 percent tariffs on US cars. But global markets were rattled Tuesday by relative silence from the Chinese about the agreement as well as by Trump’s declaration that he was a “Tariff Man” and was prepared to impose higher levies if Xi did not live up the agreement forged on the sidelines of the Group of 20 summit meeting in Argentina. Meanwhile, another development has emerged that may complicate trade talks. The chief financial officer of the Chinese technology company Huawei Technologies, Meng Wanzhou, was arrested Saturday in Canada at the request of the United States, according to Canadian authorities. The arrest of Meng, a daughter of the company’s founder, is likely to escalate tensions between the United States and China over technology issues, just as the two countries appeared to have reached a trade truce. Huawei, one of China’s biggest makers of telecom networking equipment and phones, has long faced scrutiny as a security threat in the United States. Washington has expressed concern about using Huawei’s telecommunications equipment, citing spying risk because of the company’s close ties to the Chinese government. Huawei has been under investigation for breaking US trade controls to countries including Cuba, Iran, Sudan, and Syria. After upsetting the markets with his tweet on Tuesday, Trump on Wednesday tried to put a more positive spin on his negotiations with the Chinese. “Not to sound naive or anything, but I believe President Xi meant every word of what he said at our long and hopefully historic meeting,” Trump tweeted. In a separate tweet, Trump pointed to a Bloomberg News report that said Chinese officials were preparing to restart imports of US soybeans and liquefied natural gas. That report could not be immediately confirmed by The New York Times, and analysts have been left wondering about the scope of China’s spending spree. It would take a drastic shift in trade patterns or US production levels — or both — for China to be able to purchase $1.2 trillion of exported US goods over the next year. The United States is on pace to export about $1.7 trillion in goods to the entire world this year, according to Census Bureau data. Only about $126 billion of that will go to China. That means, in order to hit the target Treasury Secretary Steven Mnuchin has discussed, the Chinese would need to buy almost 10 times as many goods from the United States next year — and 70 percent of the goods the United States exports, at current levels. Trump suggested two commodities on Wednesday that could fit the bill: liquefied natural gas and soybeans. In both cases, China has effectively halted what had been large purchases of US exports, in the midst of the trade war. Simply returning to previous levels would be a significant win for US farmers — but it would not come close to $1.2 trillion. In the 2017 fiscal year, before trade tensions flared, the United States exported about $22 billion in agricultural products to China. For the 2018 fiscal year, that fell to about $16 billion. For the 2019 fiscal year, it is projected to fall further, to $9 billion. That is a $13 billion gap from the pre-trade war levels, which, if filled with Chinese purchases, would take 92 years to add up to $1.2 trillion. Likewise, China stopped importing any US liquefied natural gas in September, after buying 10 million cubic feet of the gas in September 2017. At this year’s prices, that was a loss of about $47 million — though overall liquefied natural gas exports continue to trend up for the United States, as countries outside of China increase their demand. Such promises from Trump have left some US agricultural industries on edge, waiting for information about when exports to China would begin again. Despite the Trump administration’s claim that China would begin purchasing US agricultural products immediately, the industry has not seen any uptick in buying.